When a child is abducted by a stranger, the first thing a parent should do is contact law enforcement. They are desperate to find their child and the police are there to help. But what about when a child is abducted by a parent? Shouldn’t the left-behind parent handle the matter in the same way he or she would if the perpetrator were a stranger? The answer is “yes,” but in far too many cases, parents whose children are abducted by their other parent want to keep the incident private and do not contact law enforcement. Statistics show only one in four parental abduction cases is reported to the police. In many cases, the length of time between the abduction and contact with law enforcement is delayed far longer than had the child been taken by a stranger. It can be frustrating frustrating when police say they can’t help. Why Don’t Parents Want to Report Parental Kidnapping? The issue varies from case to case, but for many, the reason why parental abduction is not reported in a timely matter is two-fold. First, the left-behind parent thinks he or she can handle the issue without help. After all, they’ve been dealing with their child’s other parent all along, so why should this be any different? Second, law enforcement, unfortunately, consider this at times a “family dispute.” They do not, or are unwilling, to get involved, especially if there is an existing agreement and/or custody Order. Other people feel embarrassment or shame that they allowed the abduction to happen, even though they are not to blame. A child abduction can happen to any family at any time, regardless of the measures taken to reduce the risk. But because the child was taken by a known perpetrator, the other parent often thinks they should have seen the warning signs and done something to prevent the incident from occurring. People might want to protect their child’s other parent from the penalties involved in a kidnapping. Even in the most contentious divorce situations, a person might not want his or her former spouse going to jail. They know this is a possibility with kidnapping and try to keep law enforcement and the court system out of the matter. Some parents fail to report the abduction because they think it will upset the child. They don’t want their child’s feelings to be upset. Additionally, they don’t want law enforcement to make a family matter scarier than it already is. Some parents assume that if a child doesn’t realize he or she has been abducted and thinks it’s just time with his or her parent the experience will be easier. The issue with relation to the police or law enforcement is that they don’t get involved in “domestic disputes” or “squabbles.” Clients have told us that the police say to go to family court to enforce the custody agreement which makes no sense since the other parent has absconded. It is best in a situation like this to hire an attorney that can navigate the system. Click on the following link to learn more about how parental kidnapping can affect kids long-term. What Can Be Done If Your Child is Abducted by His or Her Other Parent? First and foremost, you should contact law enforcement. The odds of your child being returned unharmed are better when the police are involved. They have resources they can use to resolve the matter as quickly as possible. If they are unwilling or refuse to help, retain an attorney to pressure the police or law enforcement. Child abduction, whether it’s perpetrated by a parent or stranger, is a crime. And just like any other crime, law enforcement should be contacted when it occurs. Local, state, and federal authorities can help..
Once your child is returned, take steps to avoid a recurrence of kidnapping. Your child’s other parent violated the custody order and damaged their standing with the court. This means that there is a good chance his or her custody rights could be eliminated temporarily or permanently. He or she might also face jail time and financial penalties. There are important things to remember if you are concerned about parental kidnapping. Most importantly, you need to act fast to resolve the matter. Contacting law enforcement is never a question. It should be the first thing you do as soon as you realize your child has gone missing. 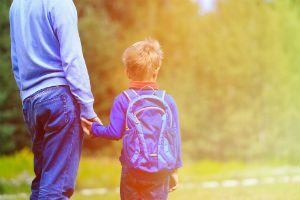 A family law attorney familiar with custody issues and parental abduction can also help you immediately and over the long-term as matters related to custody change. For more information or to schedule a consultation with an experienced child custody attorney, contact Gourvitz & Gourvitz, LLC at (973) 467-3200 or (212) 586-1700.